What does it take to be a successful entrepreneur in the Canadian business landscape? How do you manage the ups and downs of a growing business? In his first eBook, Delve In, Dig Deep: An Entrepreneurial Journey, Adam Froman shares the lessons he’s learned over the past 15 years, as he’s taken his own company from idea to successful reality. As CEO of Delvinia—a leading digital strategy and customer experience design firm—Adam’s entire career has been driven by passion and a vision that interactive technologies would change the way we communicate, work and play. From a user’s point of view, the digital world is not about creative, or technology, or even content. It’s about how all of those can work together to create more meaningful and relevant experiences. In the beginning, though, people weren’t quite ready to use technology in this way. Froman knew that he and his company would be evangelists—preaching the gospel of what interactive technologies could be, and living on the bleeding edge of a new world. Since those early days, Froman has faced his fair share of challenges. He’s survived both the dot-com bubble burst and the global recession; and the structure of the company changed as he and his partners went their separate ways. Whether you’re a small business owner, thinking of launching a start-up, or simply interested in the world of Canadian business, Delve In, Dig Deep: An Entrepreneurial Journey is a must-read. Adam Froman is the CEO of Delvinia, a Toronto-based digital strategy firm he founded in 1998. His entire career has been driven by passion and a vision that interactive technologies would change the way we communicate, work and play. As an entrepreneur, Adam has dedicated himself and his company to helping clients respond to the opportunities and challenges that digital technologies bring to customer relationships. He is a frequent speaker at business events and has advised financial institutions, media companies, arts organizations and retail brands on digital strategy and customer experience. This is his first book. Delvinia DIG is a quarterly report prepared by Delvinia. The report is a compilation of the perspectives of Delvinia’s interactive experts based on data generated by our proprietary online consumer research panel, AskingCanadians™. For brands today, the importance of knowing who their customers are and how they buy, seamlessly moving in and out of offline and online worlds has never been more essential. What was once a straightforward path to purchase has become a dynamic, non-linear digital customer journey. Download (PDF) 9 Questions Clients are Asking Us About Customer Journey Mapping and hear what Delvinia’s customer experience experts are saying about Customer Journey Mapping. The proliferation of technology is fundamentally changing the way governments and their citizens interact. Governments are now exploring ways to leverage digital technologies to engage citizens by creating better experiences and more opportunities for interaction. Internet voting is one such way. 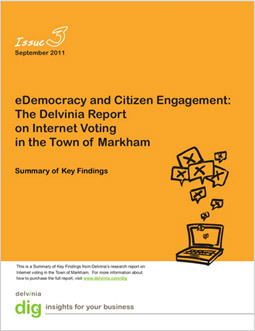 Our latest DIG report examines the Town of Markham’s experience with Internet voting in the 2003, 2006 and 2010 municipal elections and provides a detailed overview of the impact of digital technologies on citizen engagement. 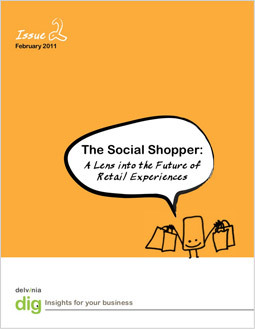 The Internet and social media have created a landscape where consumers are a more significant force than ever before. And, digitally-savvy shoppers are leading the way. Our study around consumer use of digital technology—conducted through AskingCanadians™—reveals that digital experiences are not only a key component in the purchase process; but digitally-inclined shoppers are fast becoming the consumers of the future. If you’ve ever left your mobile phone at home, you’ll understand how heavily Canadians have come to rely on their mobile device. 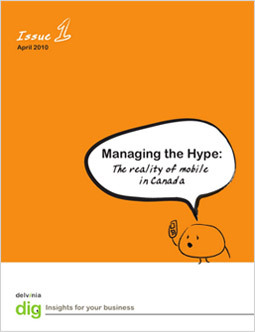 However, our study of Canadian mobile behaviours conducted through AskingCanadians, revealed that most mobile owners don’t appear to be using the more advanced features that mobile providers tout and marketers dream of fully leveraging.